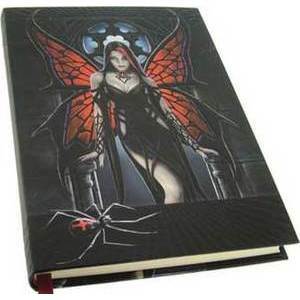 Beautifully embossed journal, by fantasy artist Anne Stokes, embossed journal collection. This designer journal, is indeed beautifully designed with embossed metallic paper, that enhances and highlights its attracting beautiful artwork, making Aracnafarias dark places nearly come to life. 5" x 7" - 160 unlined pages of sustainable acid free forest paper, with an attached silk page bookmarker.